All Five Guys are in the Top 20 in Yards and the Top 10 in YPC!!! Jeudy, Ruggs III, and IRV are #1-3 in TD's!!!! No question they are the best in the SEC and arguably the Entire Country as well. I'd say they are the most 'Dangerous' group no matter when/where the hell they catch it!!! It's funny. When the trio was signed, there was some talk that the coaching staff likes to have one first round caliber WR on the roster but they felt all three had the ability. Think we're seeing it now along with Waddle and Irv Smith (who is moving up draft boards, too). It's one of the great receiving corps in college football history in terms of both stats and performance. Though there are no physical freaks in terms of size, in fact they are all thin but wiry, they are fearless and tough as nails and have great hands. It's a remarkable group. Bama has not recruited or used many big WRs but mostly avg size with speed and quickness. This makes sense with the current rules. Bama's focus has been on who can get open by speed/quickness/route-running, plus who can take it to the house. Irv has caught me the most off-guard out of the group. He has become an absolute weapon at TE!!! All 5 guys are going to start on Sunday's.... no question about it!! I wouldn't say Irv Smith caught me off guard because I saw flashes last year of what he could do. But I am surprised at just how much of a weapon he has become. He is an absolute match-up nightmare for linebackers and most safeties. He's going to be a rich man soon enough. It is great to see him used. remember the NC when we used the TE and beat Clemson. We have had some great TE's and just never fully used them. Good to see the big guys getting in on the plays. I looked at Tua's stats through 9 games 9 games 2361 yds 27 TD's at this rate if he plays 15 games and stay on his average he will be 15 games 3935 yards and 45 TD's.. If he does this all the WR's and TE's numbers will get much better. A certain person is missing from the list. This is why I can't take CFBfilm serious. Yah that cannot be correct. If you catch the ball fifty yards down field and run 10 yards for a score. It is 10 yards after catch. So 10 divided by 60 make that a 16.7% yards after catch. 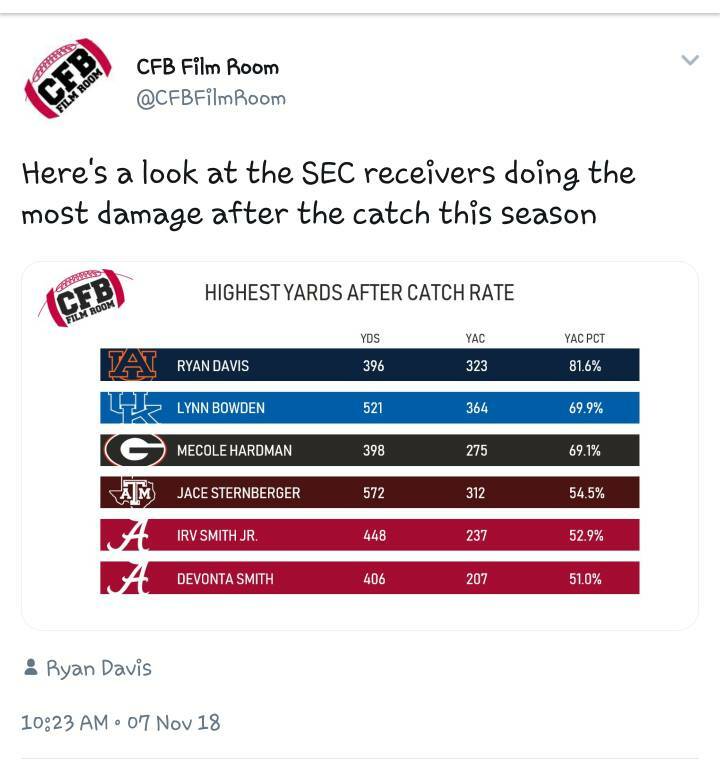 That would explain Jeudy not being o that list.